"As you may know, the Omnia Pro 4 was announced in June alongside Omnia Pro 5, two Bada-powered phones (Wave 2 and Wave 2 Pro) and Galaxy 3 (I5800). It has a candybar form factor, sporting a full QWERTY keyboard a la BlackBerry and such things as 2.62-inch QVGA touchscreen, 3.2-megapixel camera with auto-focus, HSPA and WiFi connectivity, GPS, 3.5mm headset jack and a microSD memory card slot. 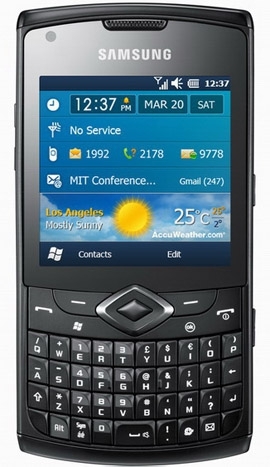 Windows Mobile 6.5.3 is running the show and there's also the Office Mobile 2010 suite pre-installed on the device." Well, what have we here? Does this image get your motor running? If you are a big Windows Mobile 6.5.3 fan there's no need to wait for Windows Phone 7 to get a brand spanking new and capable smartphone for your busy daily use. Samsung has not forgotten Windows Mobile 6.5.x, and as Mobile Burn has reported, the specs look quite nice for this particular form factor. So will this get WMP7? So will this get WMP7? Is it even a possibility? Will they do it? Not a chance. Not even the HD2 can get Windows Phone 7. Microsoft has made it clear that no current WinMo 6.x.x devices will get Windows Phone 7. Even some people trying to force Windows Phone to run on an HD2 found some hardware incompatibility or something and, last I saw, had no luck. I use it as my work phone and it just works. But I wish they had shipped the B7350 earlier since I prefer Professional edition because more software works there. I just checked and it is already down to 230 Euros. Maybe I get it anyway. Last edited by tw; 08-24-2010 at 05:16 PM..